I spent the Easter weekend in South Wales visiting my family, which meant I was at my Dad’s house in Caerphilly for the 4am project on Sunday 4th April. Now on recent visits to Caerphilly I’ve noticed an increasing amount of Tom Cooper’s dotted around the town, where he was born. 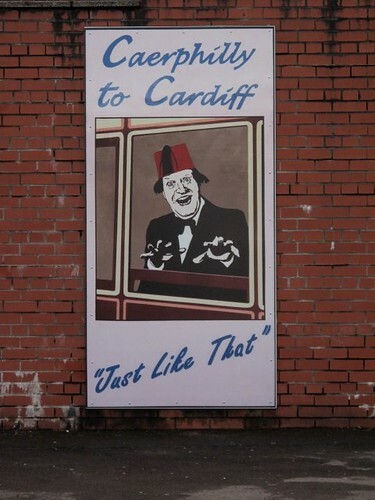 It seems we have the Caerphilly-based Tommy Cooper Society to thank for this – they are capitalising on the connection despite the fact that his family moved to Exeter when he was three. 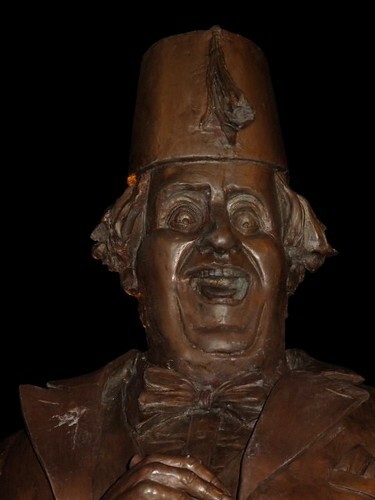 The Tommy Coper Society raised the funds for a Tommy Cooper statue in the town centre, which is what I made a beeline for at 4am. 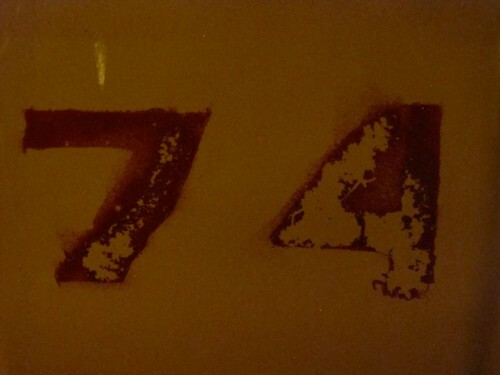 His big, beaming face grinning down at me looked downright sinister in the darkness of night. It was kind of scary. 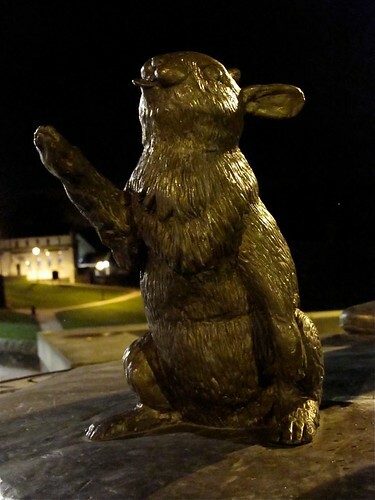 But it wasn’t as scary as the bunny that stands at the foot of the sculpture, which was trying to crush The Courthouse pub down the road with its giant paw. Tommy’s bunny wasn’t the only animal I came across. 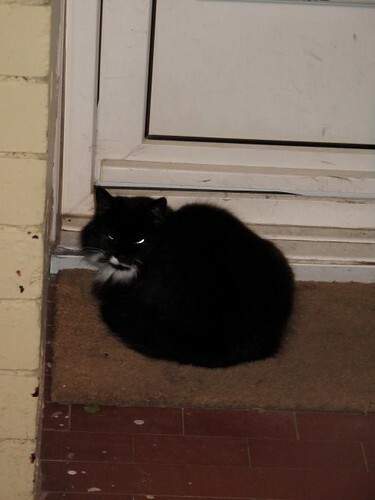 I met this very cold-looking cat sitting on a front doorstep. The other beasts I saw were on bins. 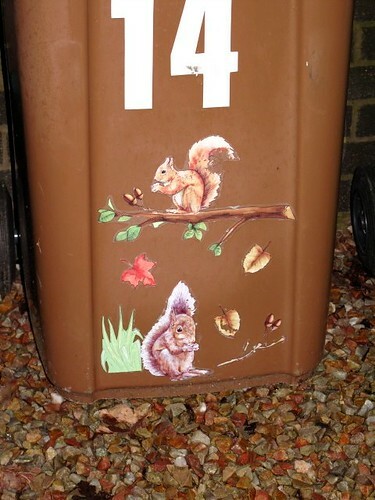 There seems to be a trend in Caerphilly of people decorating their wheelie bins with squirrels and the like, it’s very odd. 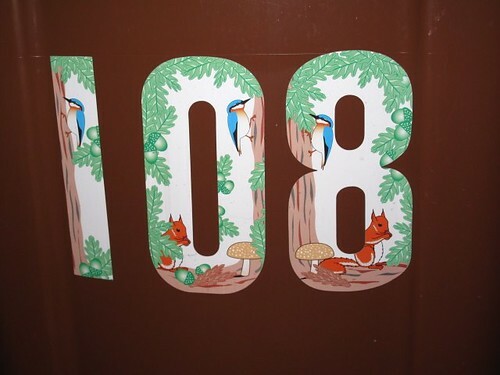 Those that didn’t pimp up their bins indicated the house number in the normal way with paint, but even that could look quite funky in a distressed sort of way. This is what I love about the 4am project, it really makes you notice things in your surroundings that you just don’t tend to see in the hustle and bustle of daytime life. The big 4am project date is barely over, but organiser Karen Strunks isn’t resting on her laurels. She’s just announced an extra special 4am outing to the Birmingham Museum Collections Centre this Saturday, an Aladdin’s cave of historical treasures in Nechells. 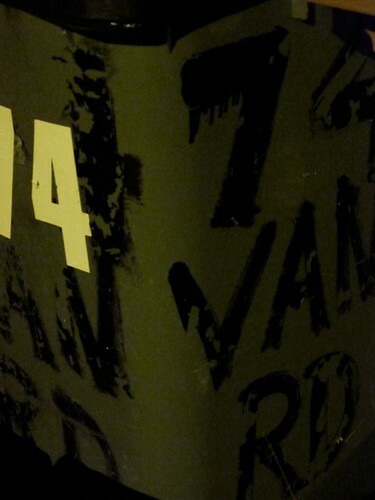 Who knows what you might notice there in the dark and quiet of night?